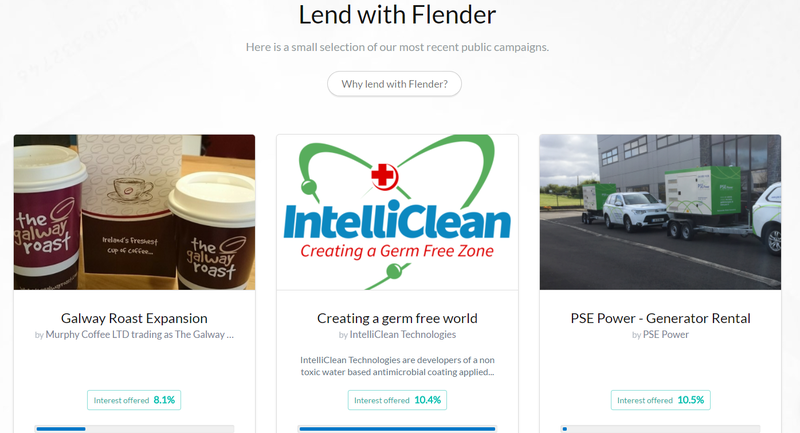 Flender is a new UK/Irish peer to peer lending platform with a social slant. For a business or consumer to borrow on Flender they first have to successfully raise funds from their friends or customers before opening up the opportunity to the wider public. Flender hopes this will help to reduce defaults, and do it in addition to standard checks run by other P2P lending sites. Current lending opportunities offer interest between 8% and 11%, though borrowers can set their rate as they like. Flender makes its money from a 2.5-4% margin on consumer borrowers or a 3.5% fee to businesses after a successful funding raise; there are no fees for lenders. They’re originally based in Ireland, which for me is really interesting for a few reasons. The first is that there have been very few Irish peer to peer lending sites, quite surprising for a county that is usually very quick to capitalise on any Tech trends with tax incentives, startup relief and research and development credits. In fact, the Irish government is specifically targeting the FinTech market with a five year plan of incentives called IFS2020. However, there’s just 2 Irish peer-to-peer lending companies, Flender and Linked Finance. Why so? Outside of the UK, Latvia has been particularly popular to start up a new peer to peer lending business (arguably due to light-touch regulation). Most of the EU platforms don’t apply for the UK regulatory FCA approval. What’s interesting about the Irish platforms is that both of them have full FCA authorisation: Flender the start of May and Linked Finance just last week. The third reason I find Ireland interesting is due to the lending market itself. Twino and KPMG published an interesting joint report recently [link: 2.3mb pdf download] which ranked European countries by the opportunities for expansion of alternative finance. Ireland was one of the countries with the highest potential, i.e. they have more inefficiency and/or a higher credit gap where borrowers have a lower probability of obtaining a loan or face more stringent loan issuance criteria. According to the report, alongside Greece and Poland, Ireland is in a sweet spot with >€100bn volume and high opportunity for expansion of alternative finance. While the current opportunities are just to Irish borrowers, they are adding UK loans now after the successful FCA authorisation. Borrowers can set any rates they like, even 0%. Borrowers can make private campaigns if they like, only viewable to people they invite privately. This could be someone who wants to use the platform to borrow capital but doesn’t want to make it public. Lenders can be from anywhere, not just UK/Ireland. Loans can be to both consumers or businesses, but the focus is businesses. One of the biggest hassles of non-UK platforms for UK residents is currency conversion and bank charges. Flender do an in-house currency conversion solution. You can transfer from the UK to their UK bank account and lend to Irish borrowers from within the platform. They charge a 3.5% fee to business borrowers on a successful campaign. Within this fee they also help them to build and market the campaign. *If you join and invest via this link you will recieve 10% cashback if you sign up and invest over £1,000. Cashback is payable as soon as lenders invest their funds. I will also receive a commission which goes towards running P2Pblog and the P2x sites. Capital at risk. No FSCS cover. Terms apply. What are the loan durations? Of the loans listed so far, I can see 36 and 48 months.